The cerebellum, also known as the "little brain" is a structure located at the back of the brain, underlying the occipital and temporal lobes of the cerebral cortex. Although the cerebellum accounts for approximately 10 percent of the brain's volume, it contains over 50 percent of the total number of neurons in the brain. Historically, the cerebellum has been considered a motor structure, because cerebellar damage leads to impairments in motor control and posture and because the majority of the cerebellum's outputs lead to parts of the motor system. Motor commands are not initiated in the cerebellum, rather the cerebellum modifies the motor commands of the descending pathways to make movements more adaptive and accurate. 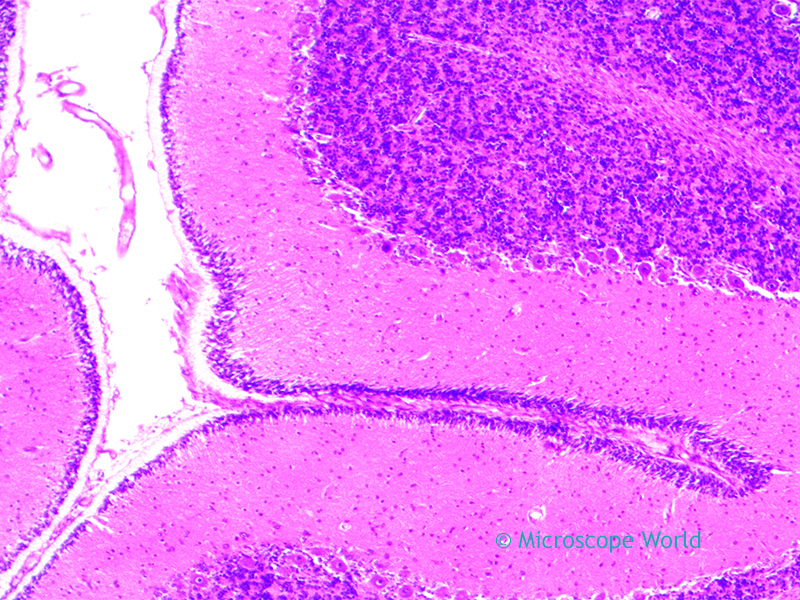 The images below of the cerebellum were captured using the Fein Optic RB30 lab microscope with the HDCAM4 high definition microscopy camera. Cerebellum c.s. under the microscope at 40x. Cerebellum c.s. under the microscope at 100x. 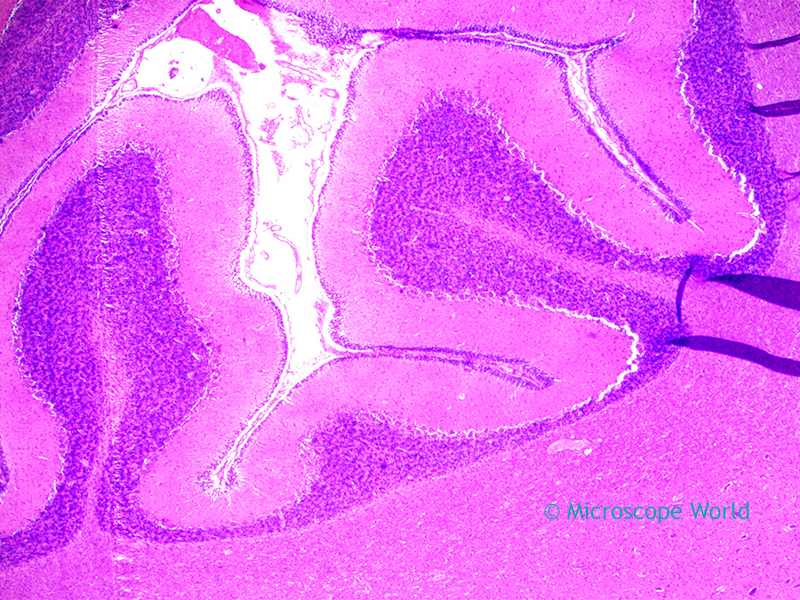 Cerebellum c.s. under the microscope at 400x using plan fluor objective lens. 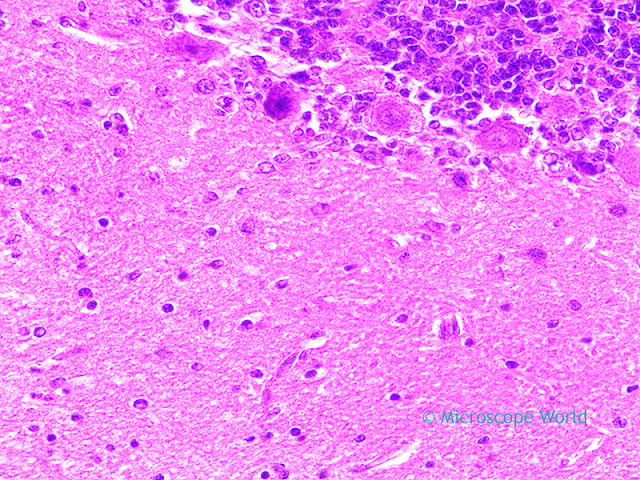 Contact Microscope World for more information on microscopes and microscopy cameras.